Good morning and happy weekend, you guys! 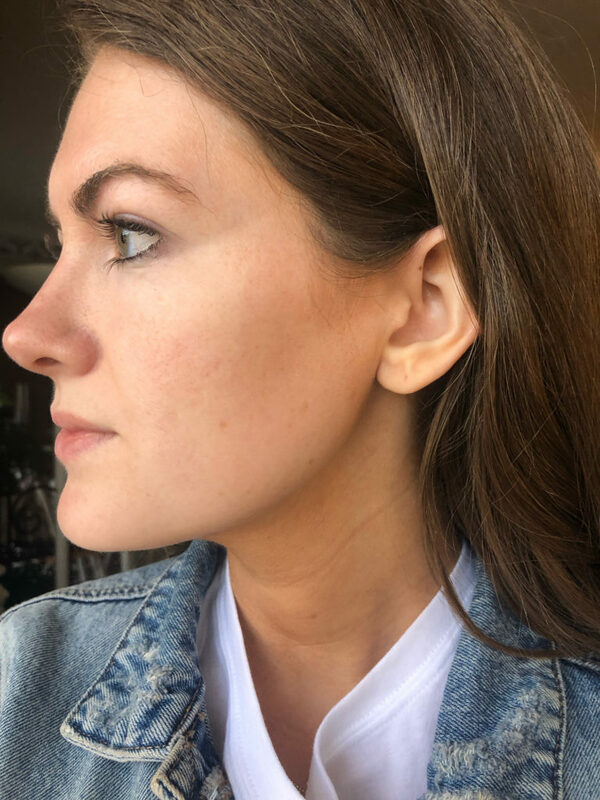 If you follow me on Instagram then you’ve probably seen me on Instastories talking about the StriVectin Skin Reset 4-week Intensive Rejuvenation System – I started exactly four weeks ago and today is my final day of the reset, so I wanted to share my results with everyone! 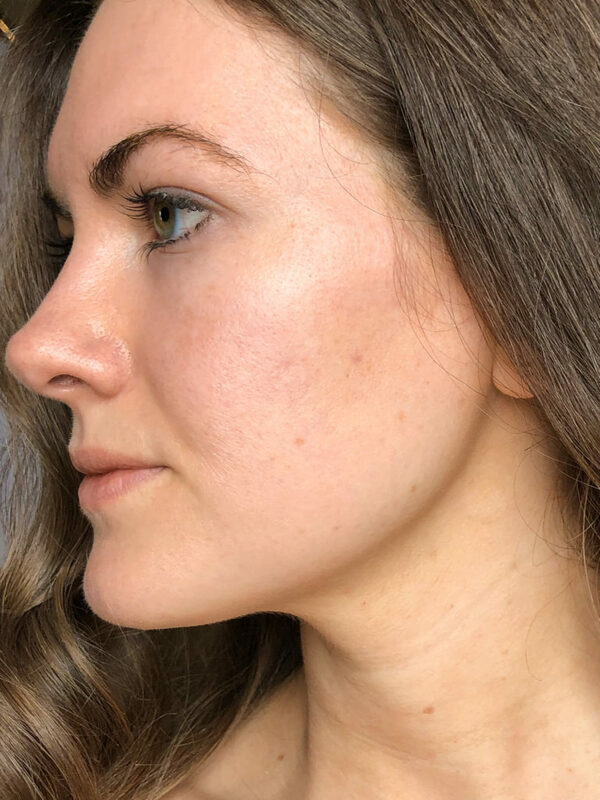 First, in case you didn’t know, the StriVectin Skin Reset is a great alternative to getting a laser treatment or botox, and it’s WAY more affordable! 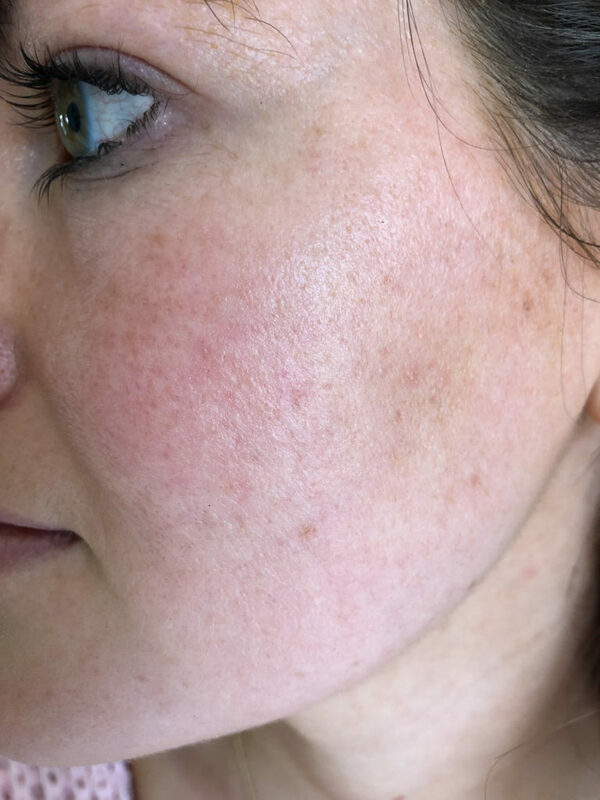 So if you’ve been thinking about trying either, you might want to look into the StriVectin Skin Reset first. 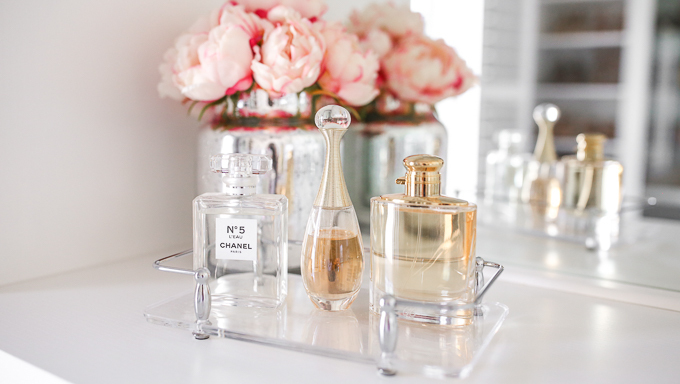 The program features four laser-focused formulas, each designed to target a core factor of skin aging, and you use one every week for four weeks (for example, you use Serum 1 morning and night on days 1-7, Serum 2 on days 8-14, etc.). When I talked to the StriVectin team over the phone, they likened the Skin Reset to a “Juice cleanse for your skin” which I LOVE! I did a juice cleanse not long ago, and it really is a “reset” for your body – you are putting all kinds of good vitamins and nutrients into your body and giving your stomach a break from digesting foods- it’s a great way to detox and simply “reset” your body. I like to think of the StriVectin Skin Reset in the same way – you are putting so many good vitamins and nutrients on your skin, you’re giving it a chance to rest and renew itself. Ok here’s the part where I share my embarrassing “before” photo with you guys! I was really diligent about writing a recap after each week, so the following will sound a bit like journal entries. And of course, the “after” photos are at the end of the post! 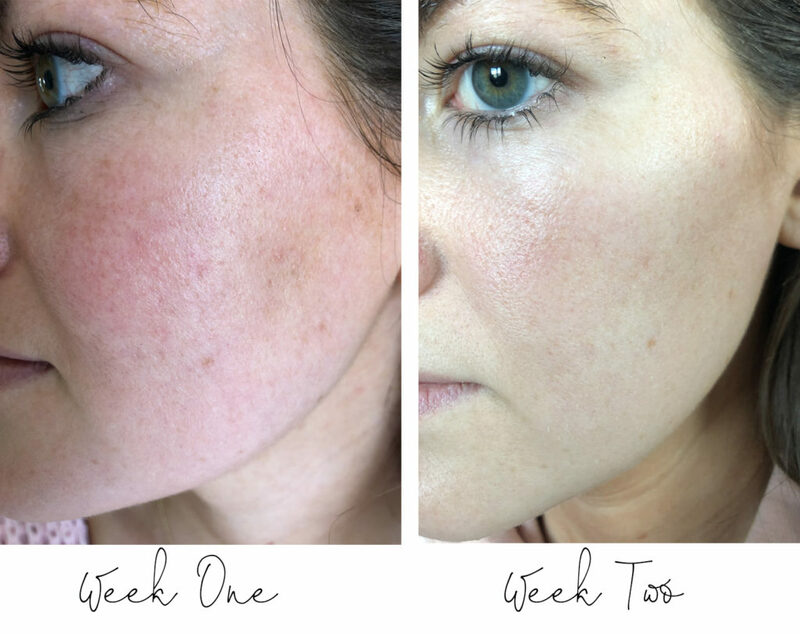 One of the reasons I’ve been wanting to try the Skin Reset is because my skin has been looking less-than-stellar over the past year, and I’m so tired of it! 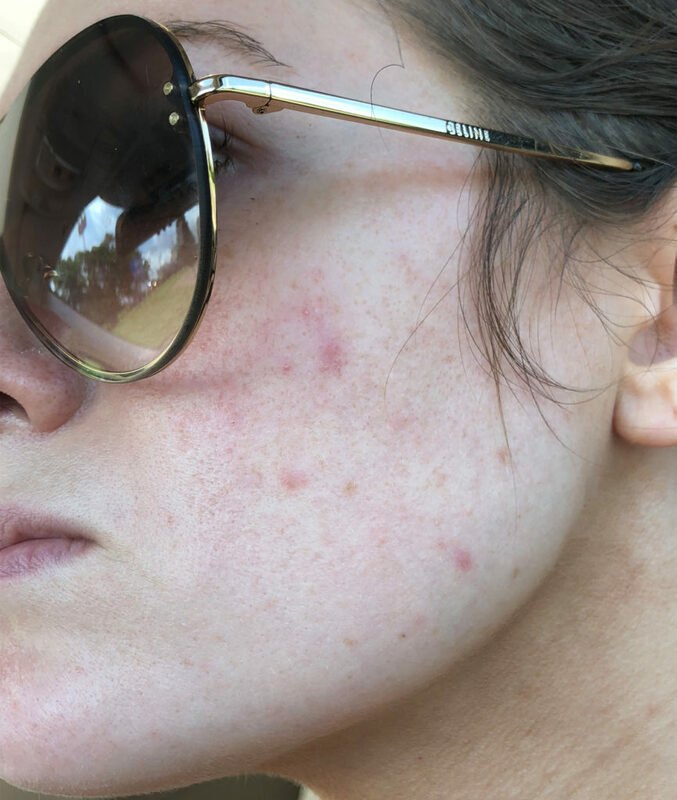 In the past year, I’ve had worse skin problems than usual – the birth control I was on really caused my skin to FREAK OUT and I had a lot of acne and redness pop up on my face, and it was so disheartening. It really affected my self-confidence – I didn’t feel comfortable leaving the house without makeup on. I decided to go off the birth control (it did not work for my body!) and even though it’s been several months, my skin is still having trouble recovering. The current state of my skin includes some dark marks from acne, some lingering redness, larger pores between my eyebrows, as well as what most women experience when they enter their late twenties: wrinkles! I definitely have laugh lines/crows feet as well as smile lines around my mouth. 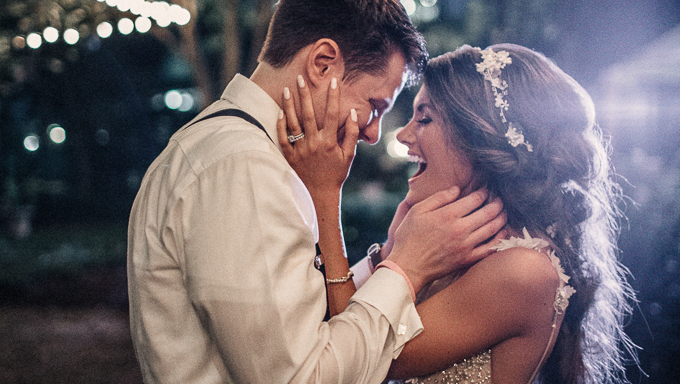 I had botox before my wedding, but I wanted to test the StriVectin Skin Reset before considering going back to my dermatologist for more. Side note: I never initially planned to share the above “before” photo with anyone, I actually snapped this photo and sent it to my mom to complain about my skin! I didn’t even want to share it on Instastories – I thought it was too “bad” and embarrassing. It’s dated the middle of February, so just a few weeks before starting the StriVectin Skin Reset. As you can see, there’s a lot of discoloration, marks, larger pores, etc. Week One is complete! So far the Skin Reset has been going really well – I’ve been applying the Week 1 Serum morning and night after I wash my face and before I put on moisturizer, and I swear I’m already seeing a difference in my skin! StriVectin Week 1 focuses on replenishing the skin’s protective layer, preventing water loss and restoring hydration. The serum has a blend of really good ingredients including Proprietary Sea Salt Ferment for intense hydration, Himalayan Herbal Extract and CoEnzyme Q10. It’s been really cold in Winston Salem and usually my skin is SO dry this time of year, but this week my skin felt plump and moisturized all week, which I’m attributing to the serum. Week Two focuses on improving skin elasticity to visibly relax fine lines and wrinkles, which is crazy because I REALLY noticed a difference in my laugh lines this week. Key ingredients in the Week 2 Serum include Electric Daisy Flower, Ceramides, Wild Yam Root (which visibly smooths lines) and collagen-boosting Hexapeptides. To supplement the serum, I also ate a lot of omega 3 fatty acids like avocado, almonds and walnuts. 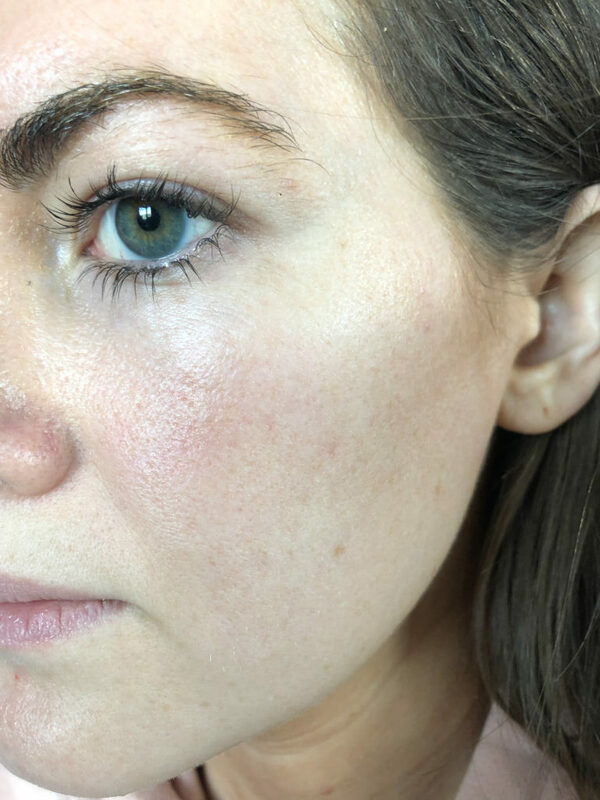 In addition to less “crinkles” when I laugh, I also noticed that my skin seemed to even out and calm down a lot – just look at the difference in my redness in the above photos! My skin looks overall happier, calmer and smoother in the second picture – and these were taken just one week apart. I felt like in week three, my skin OVERALL started to look a lot better! Week Three’s serum has a phyto-active blend of plant extracts, Tetrapeptides for targeting wrinkles and sagging skin, and Micro Algae to visibly tighten and tone. I noticed that my skin looked way more even, the appearance of redness was reduced (especially on my cheeks), and my pores looked smaller all over my face. I couldn’t believe the difference in the above photo. I even left the house without makeup on a few days in a row! I cannot believe how fast these four weeks have flown by, but I am SERIOUSLY impressed with the results! This week I flew to Palm Springs, California (for a girls trip) and normally notice a big difference in my skin after a long flight – it will look tired or puffy. however I was really impressed with my skin’s ability to “bounce back” from the flight – my skin was nice and even and seemed plump and moisturized, even after ten hours on the plane. The final serum contains Oligopeptide, Blackjack Extract and Adaptogenic “Resurrection Plant” and promises a healthy-looking complexion and a feeling of rejuvenation. When looking back at the photos, I can’t help but feel like the overall tone and look of my skin improved drastically. Although you can’t feel my skin through the computer screen, haha, it definitely FEELS better than it has in years, too – it’s smooth and moisturized – and a bunch of those annoying red and dark marks are completely gone! Looking at these photos, I’m so happy I could cry! 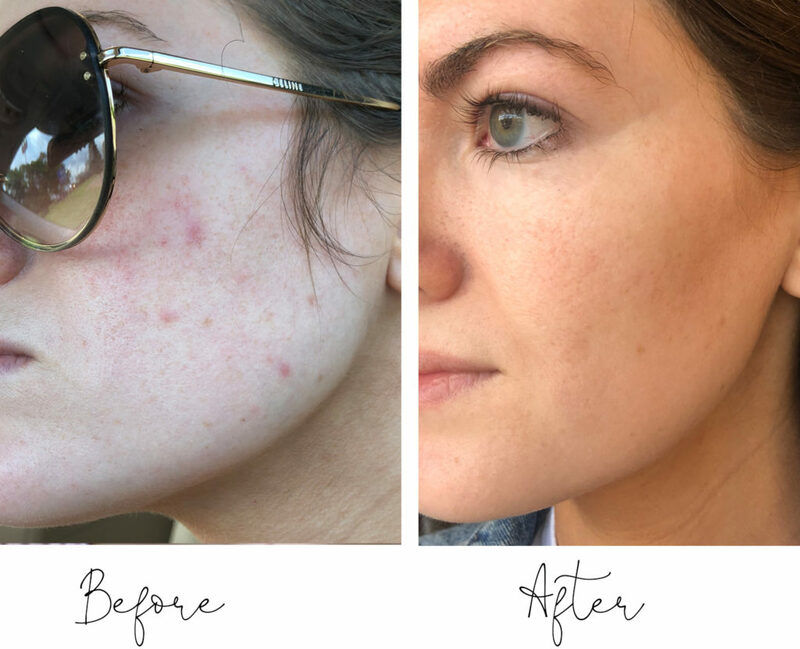 To purchase the StriVectin Skin Reset and try it for yourself, you can get it from their website HERE or an Ulta nearest you. You can read more about it on their website, here! *Thanks to StriVectin for sponsoring this post, as always all opinions are my own. This is very interesting! However, I am a little bit confused as to why the title says 14 Day Skin Reset, but it is a 4 week treatment, right? I have a lot of the same skin issues that you had: redness, especially on my cheecks and around my nose, enlarged pores and marks from previous acne, so these serum do sound like something I would try! I will definitely look into it more, thanks for sharing! Your skin looks gorgeous! How often are you supposed to use this treatment? I will definitely be trying this! I have struggled with acne and irritation on my face for years and what finally got it under control was a Clarisonic combined with eradikate face wash. You should definitely check those out! Are all your photos without make-up? Yes, all of these photos are without makeup! I plan to keep up my normal skin routine and WEAR SUNSCREEN every day! I have never been good about wearing sunscreen every day but it really protects your skin so much! Thanks! Any particular facial SPF you recommend? I’m also looking to try the strivectin cleanser/moisture to maximize results. I wish you wouldn’t do skin stories on Instagram with the filters. Saying that you aren’t wearing makeup means nothing with filters. Come on, be transparent. Hey Anna, there aren’t any filters on the above photos, nor am I wearing makeup – I don’t see how I could be more transparent than that?! Thanks for always being so real with us! I can totally tell there are no filters or makeup and it’s refreshing to see non-perfect skin and your authentic reviews. Wow! 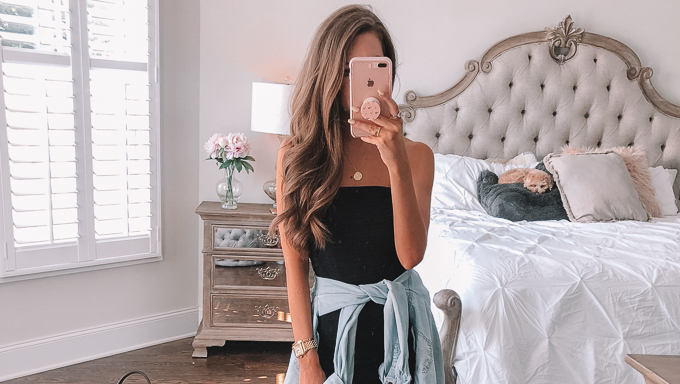 Thanks for showing us the “real deal!” So much of Insta-life looks perfect, but your willingness to show us the “behind the scenes”- especially of skincare – is just awesome. Did you also use your retinol while you did this? xoxo! Your skin looks amazing, but honestly what I noticed most in these pictures (besides your eyes which really are gorgeous) is your NOSE! I remember one time you mentioned that you had rhinoplasty, and your nose looks so good. I wondered if you would ever feel comfortable sharing about it, because it’s something I have always thought about, and I would love hearing about your experience with it, especially because your nose looks so natural. wow I really see the difference! WOW. Your skin looks so different! I just had my first baby 7 weeks ago and the pregnancy and postpartum hormones have WRECKED my skin. I never really suffered from acne but now the acne and redness is out of control. Also like you being in my late 20s almost 30 😮 I have started seeing some fine lines. I have been looking for a product to save me and this really caught my eye. I was wondering what cleanser did you use with it as I am also still trying to find a good fit for my skin since having the skin changes and you obviously had good results with the system. Your skin looks amazing!! Can’t believe how great that stuff works!! I noticed the products are serums. What facial cleanser and moisturizer were you using alongside? Were you still exfoliating with a clarisonic or anything else? Yes! You can use all your normal products such as face wash, moisturizer, eye cream, etc., just replace your usual serum with the StriVectin ones and you’re good to go! I used my normal products – bareMinerals oil cleanser and Sunday Riley Tidal moisturizer. That really did wonders for the redness on your cheeks. 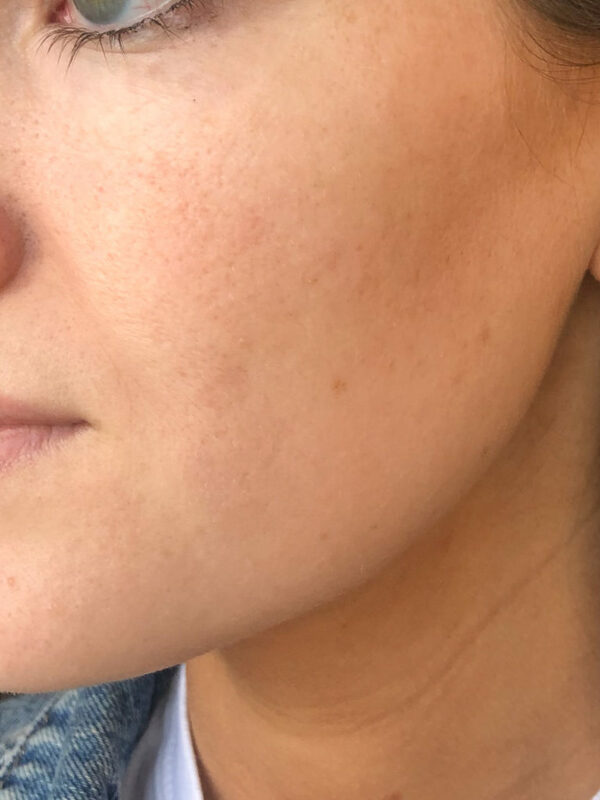 I’m pregnant and have developed redness around my nose and on my cheeks and I’ve been looking for a solution. I’ll wait until I deliver, but I’m definitely going to try this out. What a way to treat myself after birth! Thank you for your openness- it sold me ! Just bought it! Did you find this helped reduce adult acne as well? I still struggle with breakouts and I’m hoping some side benefits of this is that it helps clear my skin too.